The garlic is in! Wednesday was a huge garlic harvest day. We pulled up and laid out thousands of bulbs of garlic. 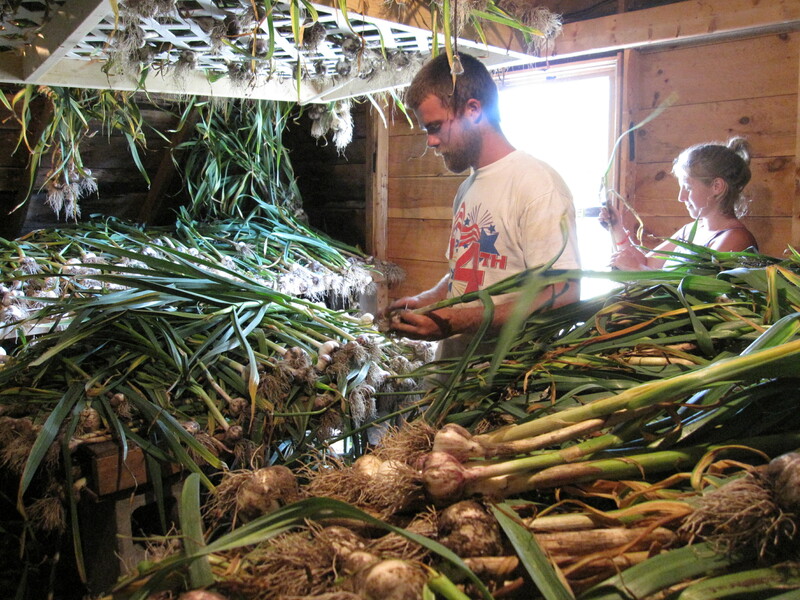 The upstairs of our small barn (in fact, the whole building) is permeated with the aroma of garlic (in a good way). We all love the fresh, uncured garlic. You can use it just as you would garlic from the store, but expect the cloves to be downright crunchy and have a fresh, strong flavor. We have enough plantings of kale and chard now that if you are interested in putting some by for winter, we can start filling orders. This offer will be available for some time to come, but we’d be happy to start picking for those who have a chance to tackle it during the summer. The price is $15 for ten bunches (filling a bag the size of a garbage bag, basically). You can specify kale, chard, or collards. Send us an email if you’re interested. Also, blueberries will be delivered Thursday (8/4), Sunday (8/7) and Monday (8/8). There are still a number of boxes available. The details, again: $35 for a 10-lb box of cleaned organic wild blueberries, from Red House Farm in Waldoboro. All but one of the fifteen ducklings that staggered out of the woods with their mama a couple weeks ago are thriving. Cookie the cow got a little greedy and stepped in their pen, trying to get to their grain. Hence we have one fewer duckling. And we now have a fourth cow on the farm — a little Jersey bull. He’ll stay with us for a few months and hopefully Cookie will get pregnant during his tenure at HCF. Have a great week and enjoy the veggies. With the green beans and potatoes it finally feels like peak summer is really here! John and Sara swimming in a sea of garlic. With drying racks stacked two high and additional racks suspended from the ceiling, we were able to fit at least four thousand bulbs in the upstairs of our small barn. Heavy duty fans will run day and night for the next month to make sure the drying process goes well.